I wonder what it would feel like to suddenly find myself with three new roommates, or if one of my classes jumped from 20 people to 35. I suppose I’ll find out soon: that’s the shift that’s set to take place in my neighborhood over the next couple years, as a series of sleek, Big Money condo towers rise along the low-slung Williamsburg waterfront. 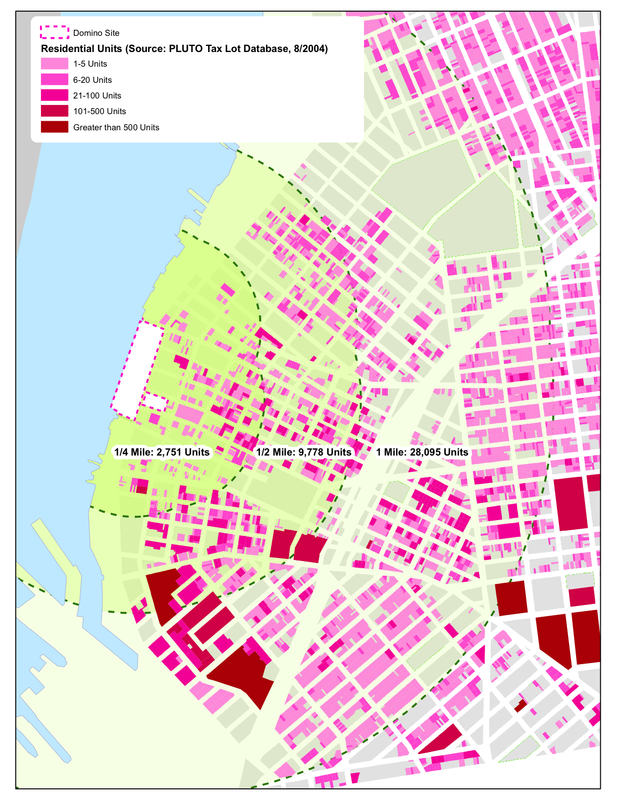 As part of the Domino Project, I’ve been analyzing the current demographics of my neighborhood to better understand of who lives here and how the proposed development at the Domino site would alter the streetlife and resources. I threw together the map above yesterday to demonstrate what the area looked like in terms of housing in late 2004: a mix of walkups, townhomes and warehouses, with the occasional yuppie-priced loft thrown in the mix. But thanks to a 2005 rezoning, my map is already out of date. Williamsburg’s overstuffed L trains and continually backed up sewers will be seeing about 5,000 more people arrive in the next several years, as construction commences on a wall of luxury condos (with a helping of affordable housing thrown in for a tax break). Towards the Bedford stop, there’s the Edge, with 892 total units, and Northside Piers, with 290 in the first of three towers to go up. South of the bridge, the 350 apartments and condos at Schaefer Landing have been open for a year or so. These projects, the largest 3 of many medium-to-large new developments in the area, will bring to Williamsburg a combined total of 2,000 units of housing – 5,000 people or so – by 2010. And then there’s Domino. According to the CPC’s current plans (PDF alert), the development there would create two 400-foot and two 300-foot towers along the water, dwarfing the Williamsburg Bridge and generating a further 2,400 units of housing. Can it really come down to doubling the population of an already overtaxed neighborhood in order to turn a profit? There’s got to be another way – one that works not just for the market, but for the community and the ecosystem as well. Don’t worry. None of this is going to happen. By the end of next year, it will be very apparent as to the reason. And to the people that got suckered into paying those “luxury” prices (over priced) condos all along Kent Ave, they will see up to a 40% drop in the prices of their properties. We are just in the beginning of a housing bust and the culprits are those over priced condos that speculators “flipped” and then got the sub-prime folks to take over. Once the stuff over by McCarren and the N 7th vicinity gets built, and mortgages that much harder to get, the Domino developers will have to reevaluate exactly what they are going to do. Since there in it for the money and the money is no longer there, I believe the Domino buildings will never get built. And if they start, they won’t finish them in time for the spectacular housing price drops that are going to occur.